The white grape variety is by far the most common variety of the Traminer (see detailed information there). The numerous Synonyms be z. T. also for other varieties such as Savagnin Rose and commonly used for Traminer. So you can not doubt the name / synonym on the "right" sport shut down. The most important alphabetically grouped by country are Savagnin Rose Aromatique ( Australia ); Mala Dinka ( Bulgaria ); Clevner, Klevner, Rother Muskattraminer, Roter Traminer, Traminer Rot ( Germany ); Bon Blanc, Gentil Aromatique, Gentil Rose Aromatique, Formulator Rouge, Fromenteau Rouge, Traminer Aromatique, Traminer Parfumé ( France ); Traminer Aromatico ( Italy ); Traminac Crveni ( Croatia ); Christkindlestraube, Christkindltraube, Fleischrot, Fleischroth, Fleischvainer, Fleischweiner, Musler, Rosentraminer, Roter Traminer ( Austria ); Rusa, Traminine Roz ( Romania ); Tramín Červený ( Slovakia ); Heather ( Switzerland ); Diseci Traminec ( Slovenia ); Tramín Červený Czech Republic ); Traminer Musqué, Traminine Rose ( Moldova. Ukraine ); Tramini Piros, Füszeres Tramini, Piros Tramini ( Hungary ). It is a taste mutation of the variety Savagnin Rose with which she is often confused or equated. 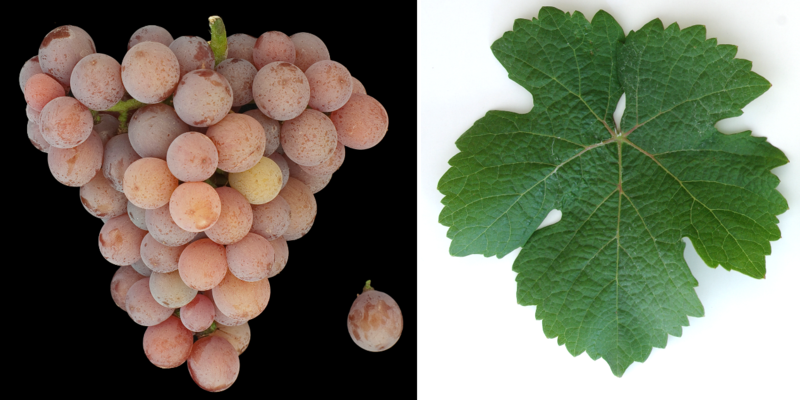 The difference between the two is the spicy Moschuston (Musqué), the Gewürztraminer of all Traminerspielarten has the most pronounced, but Savagnin Rose not or only to a small extent (which is why it is called also Savagnin Rose Non Musqué). Savagnin Rose (Red Traminer) is a rosabeerige mutation of the species Savagnin Blanc (White Traminer). The variety Gewürztraminer was also at some new varieties used (see a complete list under Traminer ). In the statistics of Kym Anderson from the 2010 quantities under the three names Gewurztraminer (with "u"), Savagnin Blanc and Savagnin Rose (but here are only two countries). In most cases, it is probably mainly the variety Gewürztraminer. For some of the countries listed below, two figures are given (Gewürztraminer / Savagnin Blanc), with only one number being Gewürztraminer or Savagnin Blanc. In Austria no distinction is made between varieties in the variety survey, but summarized under Traminer. Gewürztraminer, Roter Traminer and Gelber Traminer are considered valid synonyms. In 2009 there were 321 hectares. In Germany only the variety Roter Traminer (Gewürztraminer) is reported, in the year 2009 a total of 838 hectares. Other countries in Europe are Bulgaria (747 ha), England (1 ha), France (3,168 / 483 ha), Italy (1,408 ha), Croatia (234/18 ha), Luxembourg (20 ha), Moldova (2,731 ha), Romania (385/49 ha), Russia (214 ha), Switzerland (49/83 ha), Slovakia (265 ha), Slovenia (215 ha), Spain (301 ha), Czech Republic (601 ha), Hungary (772 ha) and Ukraine (961 ha). Overseas Argentina (20 ha), Australia (834/94 ha), Brazil (13 ha), Chile (316 ha), China (5 ha), Canada (404/1 ha), New Zealand (311 ha), South Africa (122 ha), Uruguay (24 ha) and United States (1,144 ha, of which California 700 ha). In the statistics of Kym Anderson in the year 2010 under the name Gewurztraminer (Gewürztraminer) a total of 14,355 hectares of vineyards recorded with a strong upward trend (ten years earlier it was 10,670 hectares). The variety thus occupied in the world varieties ranking rank 53. Under the name Savagnin Blanc were 1,949 acres, as well as under the name Savagnin Rose 883 acres. If one summarizes these three quantities, there are altogether 17,187 hectars, which would rank 45th. This page was last modified at 19 November 2018 at 09:04.